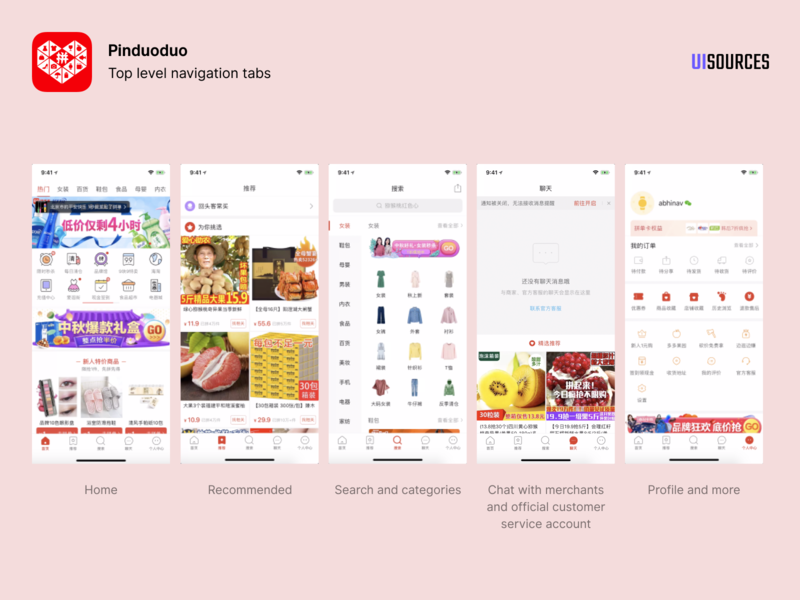 Pinduoduo is one of the fastest growing apps in China. 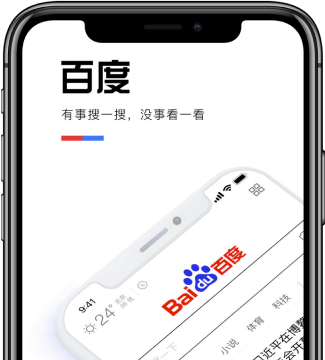 It recently IPO'd in the US and is currently worth around $13.8B. They claim to have 343M active buyers. 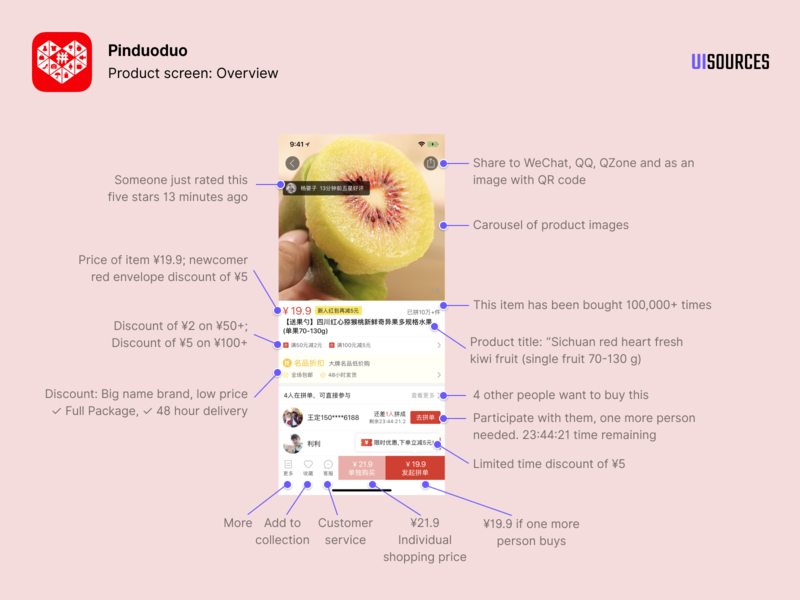 It is a social e-commerce app with a simple premise: Get a discounted price if you can get more people to buy the product. 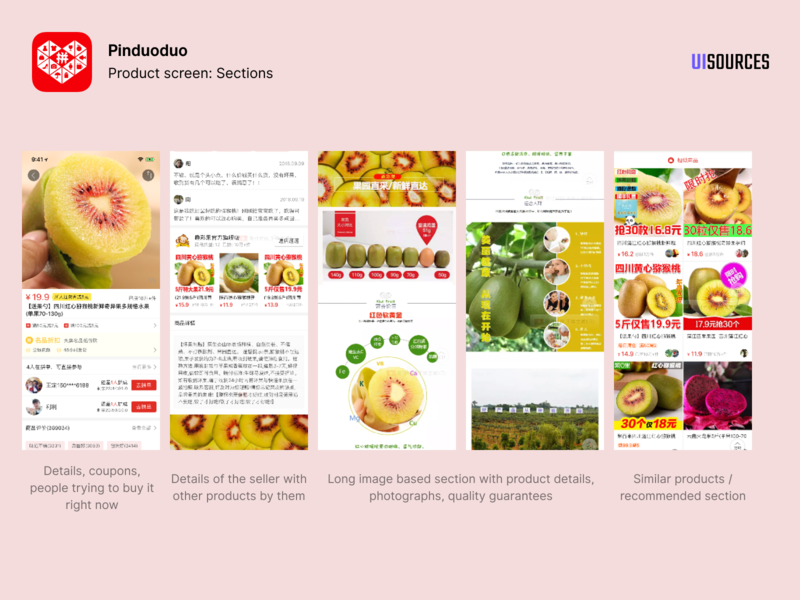 Each product listed on the app has a regular price and a discount price. To get the discounted price, you need to invite a certain number of people to also buy it with you. 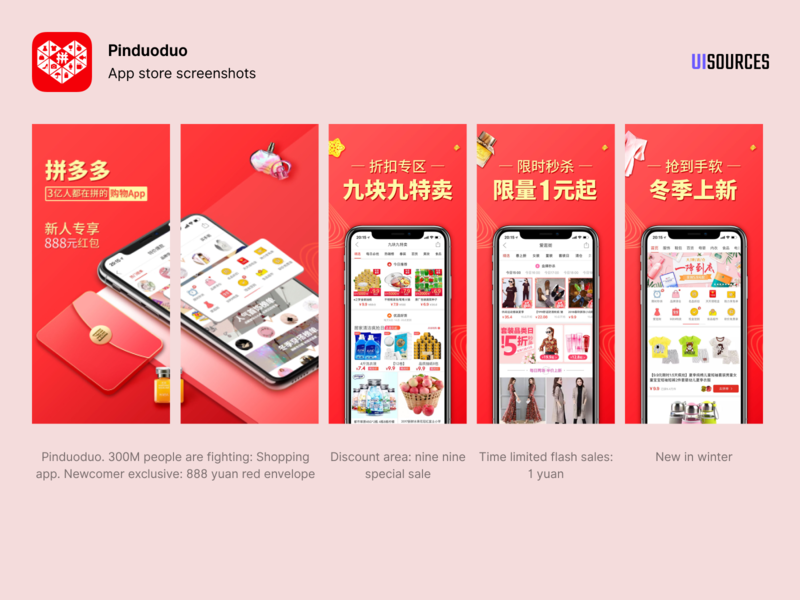 As of 2017, Pinduoduo had $21B annual GMV (commission rate of 0.6%), $278M annual revenue, 4.3B annual orders. 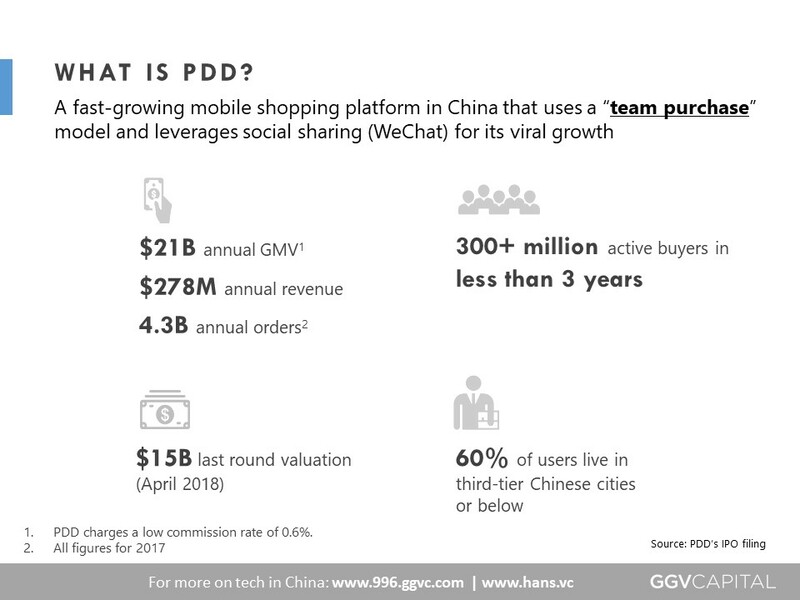 They've grown virally to 300M+ active buyers in less than three years, 60% of whom live in tier-three cities in China. As a first time user, the app asks you to turn on notifications for billing and delivery updates, flash sale alerts and featured offers. 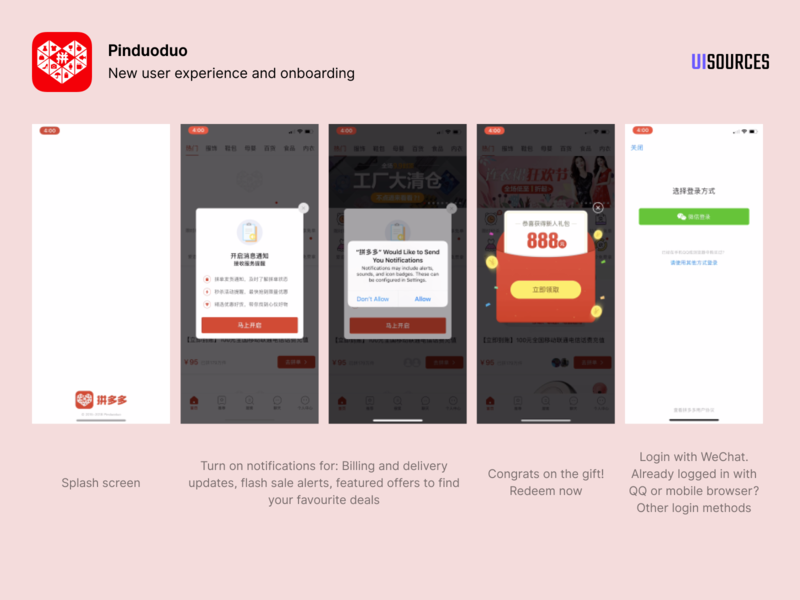 New users get a red envelope gift of Â¥888 that they have to sign up to redeem. The top of the home page has tabs to navigate different categories. 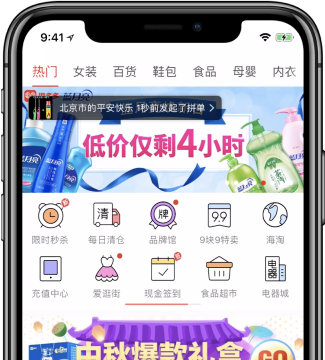 The top left has a recurring tool tip that shows recent activity like purchases and ratings for different items on the platform. There is a carousel of promotional banners. The top section has a recurring tool tip that shows recent activity like purchases and ratings for the item. 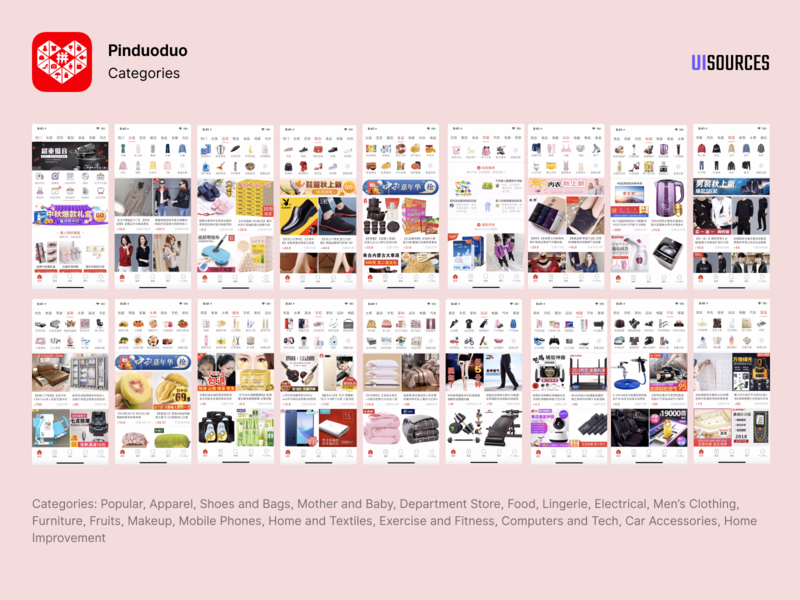 The product info section shows product title, how many times the product has been bought, discount information and delivery assurances. There is a section to see other people who've bought the item but are waiting on other people to also buy it. You can participate with them. The sticky call to action at the bottom has discount price, regular price, option to save to collection and option to chat with customer care. You can buy an item at full price OR at a discounted price. 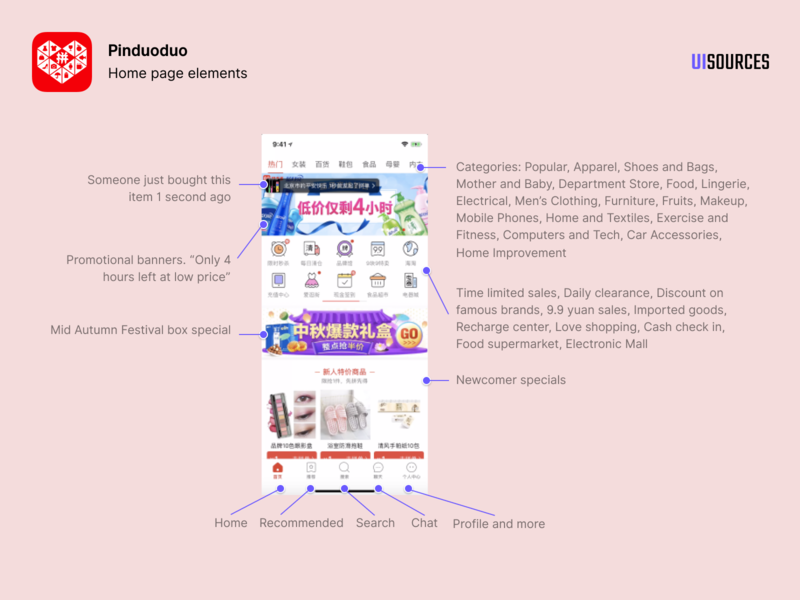 To get it at a discount price, you can join in the other people trying to buy the item and finish the purchase or make the payment and then invite a friend to also make the purchase. 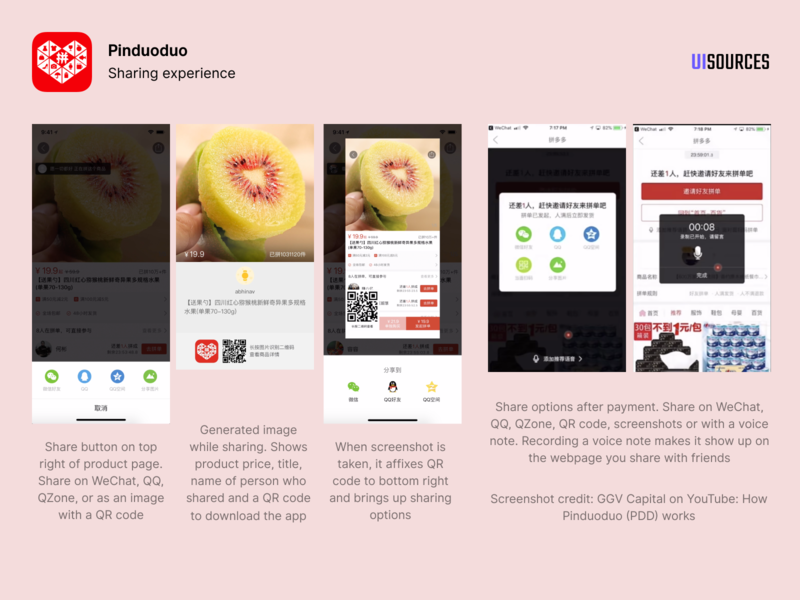 After paying, you can invite friends by sharing on WeChat, QQ, QZone, QR code, image or with a voice note. The order isn't shipped to you till the required number of people buy it with you. A great video that takes you through the entire app, including the checkout and sharing flow. 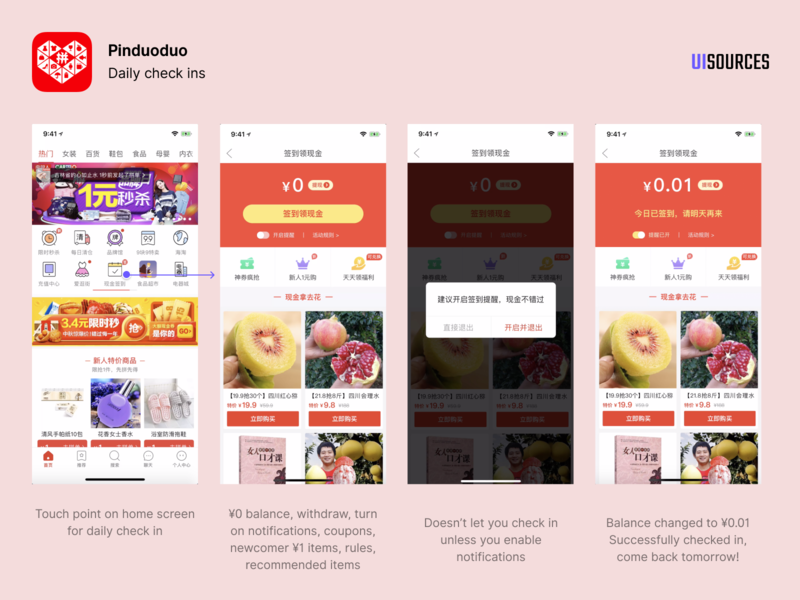 More background information on Pinduoduo in their article here. 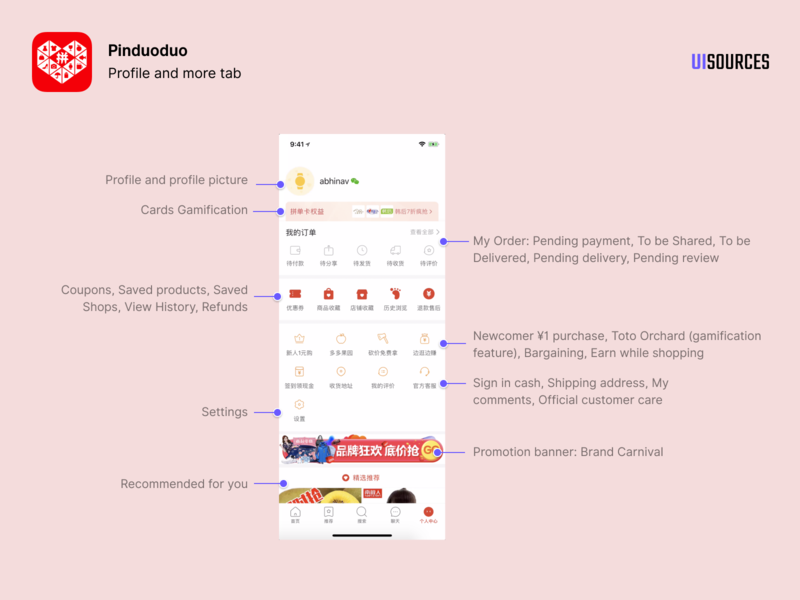 This tab contains profile information, gamification touchpoints, order related information, saved items, promotions, settings and recommendations. 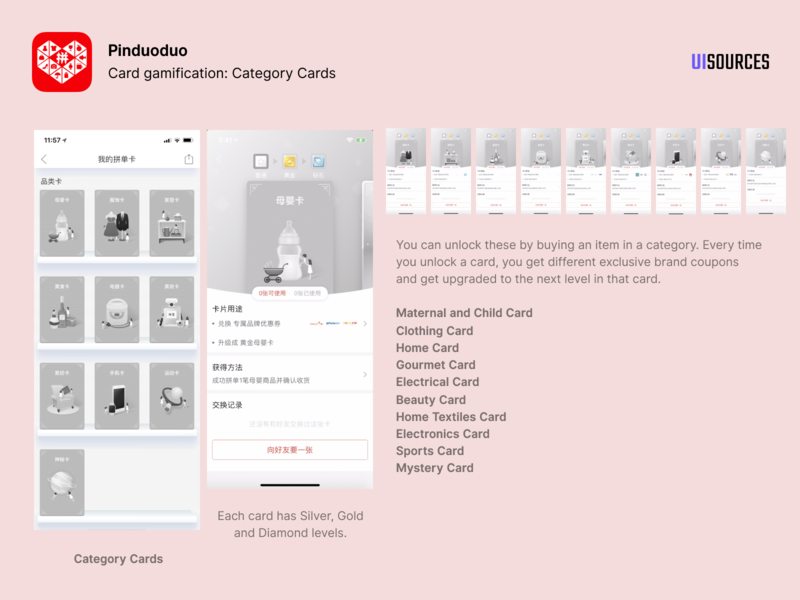 Category cards: You can unlock these by buying an item in a category. 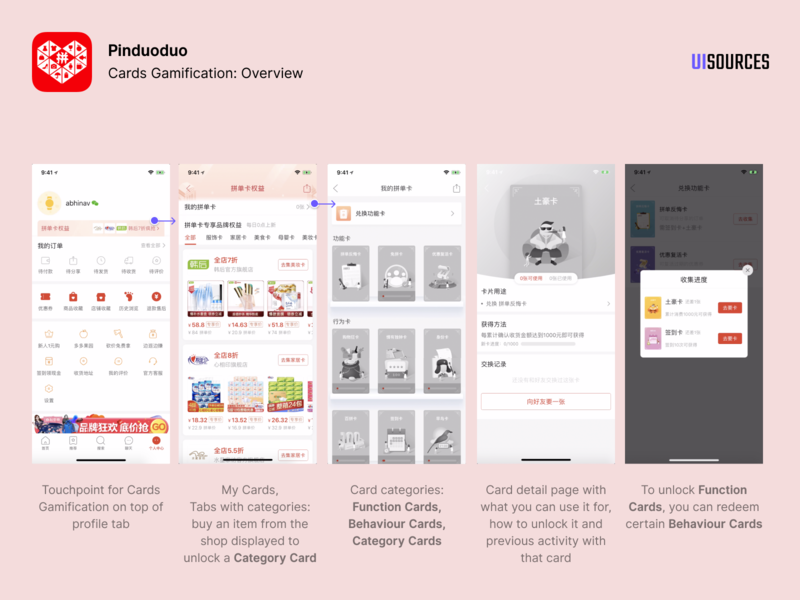 These are cards that give you special privileges within the app. 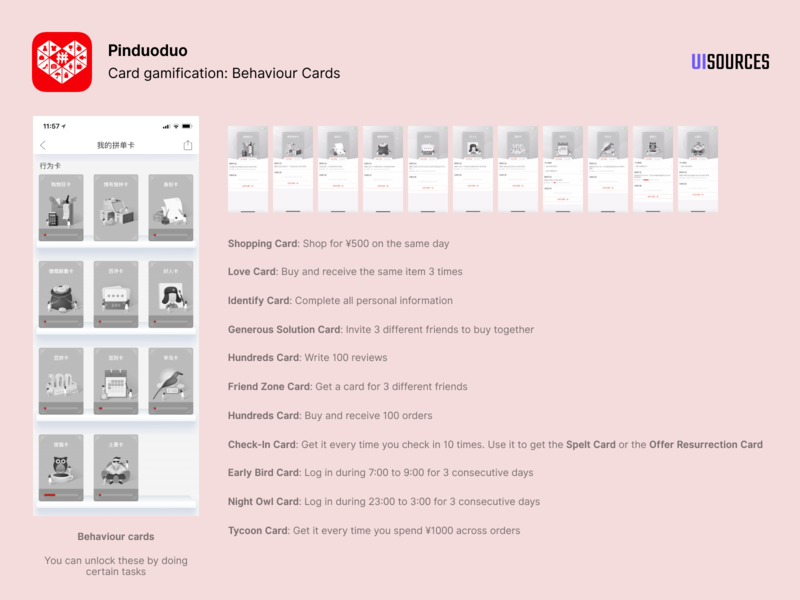 You can get them by unlocking and using certain Behaviour Cards. You can unlock these by doing certain tasks. You can unlock these by buying an item in a category. Each card has Silver, Gold and Diamond levels. 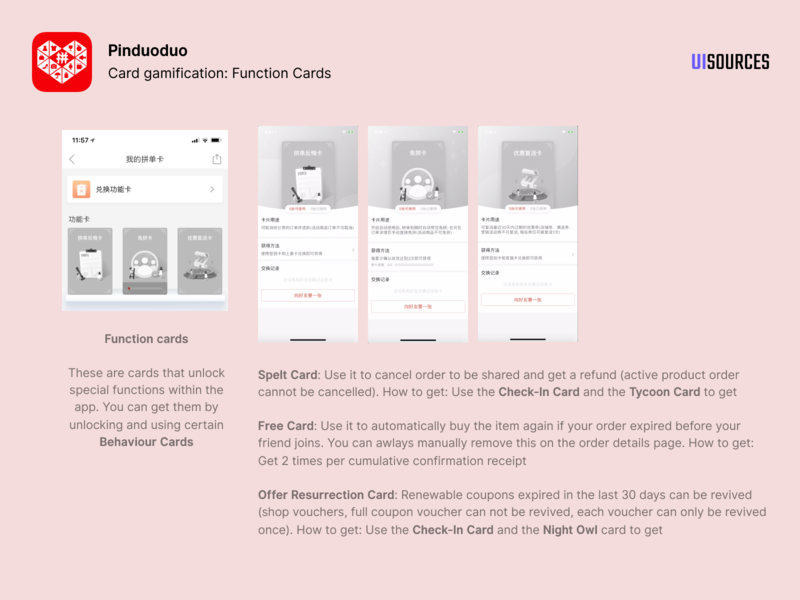 Every time you unlock a card, you get different exclusive brand coupons and get upgraded to the next level in that card. You get a small amount of free cash and unlock the Check In Card by doing so from the home page each day. It doesn't let you check in unless you enable notifications, using this as a way to ask for permissions. 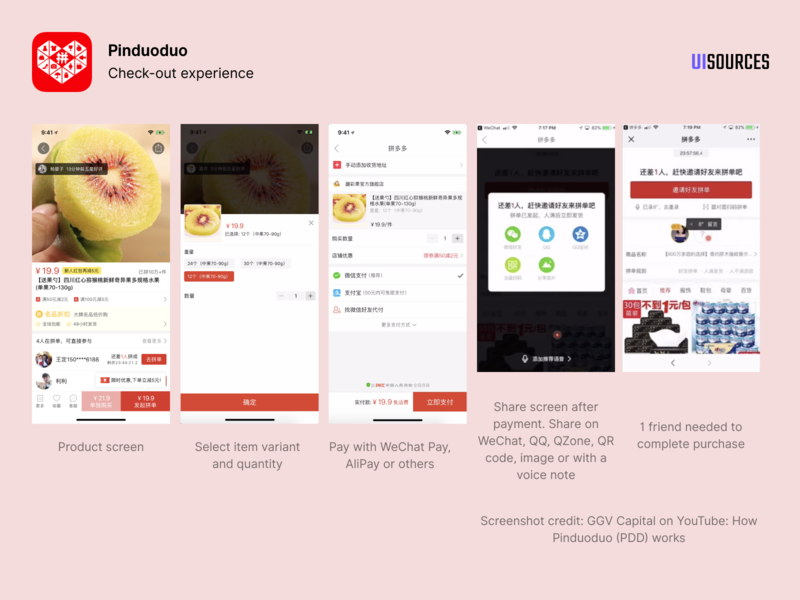 You can search for Pinduoduo's official accounts on WeChat and follow them or access their mini apps. It usually sends a message a day with promotions and offers. 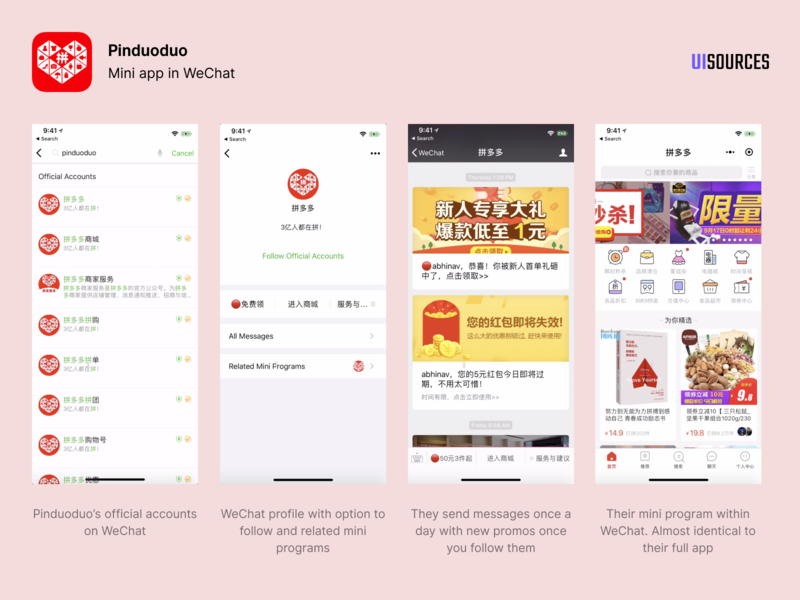 The mini app is almost identical in functionality to the main app.